This invaluable book is an introduction to knot and link invariants as generalized amplitudes for a quasi-physical process. The demands of knot theory, coupled with a quantum-statistical framework, create a context that naturally and powerfully includes an extraordinary range of interrelated topics in topology and mathematical physics. The author takes a primarily combinatorial stance toward knot theory and its relations with these subjects. This stance has the advantage of providing direct access to the algebra and to the combinatorial topology, as well as physical ideas.The book is divided into two parts: Part I is a systematic course on knots and physics starting from the ground up, and Part II is a set of lectures on various topics related to Part I. Part II includes topics such as frictional properties of knots, relations with combinatorics, and knots in dynamical systems.In this new edition, articles on other topics, including Khovanov Homology, have been included. Louis Kauffman was born in 1945. He graduated as valedictorian of his class at Norwood Norfolk Central High School in 1962. He received his BS at MIT in 1966 and his PhD in mathematics from Princeton University in 1972. Kauffman has been a prominent leader in Knot Theory, one of the most active research areas in mathematics today. His discoveries include a state sum model for the Alexander-Conway Polynomial, the bracket state sum model for the Jones polynomial, the Kauffman polynomial and Virtual Knot Theory. 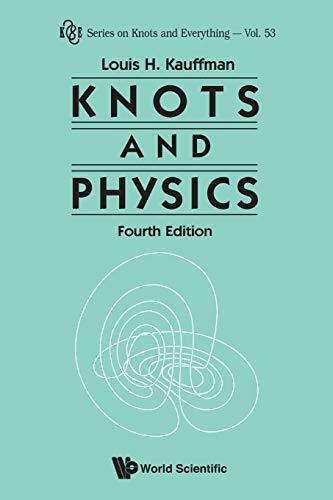 He is the Editor-in-Chief of JKTR, Editor of the Series on Knots and Everything, full professor at UIC and author of numerous books related to the theory of knots — including Knots and Physics", "Knots and Applications", "On Knots", and "Formal Knot Theory".